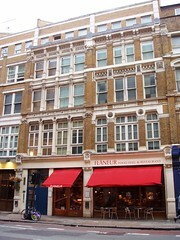 Flaneur was a food hall and restaurant near Farringdon Station; alas, as of April 2009, Chris of Londonist reports that Flaneur has closed and is in the hands of the liquidators. The information below is retained for people who want to know what it used to be like. A food hall near Farringdon Station with an eccentric selection and a restaurant offering high quality French-style cooking using fresh British ingredients (often their own produce and that of the nearby market). As a restaurant, Flaneur serves unpretentious French cuisine based on good ingredients at a price that is not stratospheric (starters from £6 to £10, main courses £13 to £18, fixed price meal £17.50) from a menu that changes on a daily basis. To go with your food, they have an impressive selection of good wines, beers, ports, sherries, brandies, liqueurs and juices, all of which are also on sale from the food hall. The desserts are not only high quality but an experience, since they are normally accompanied to the table by a huge bowl of Chantilly cream (so well whipped that you could stand the ladle upright in it; itsbruce knows people who want to dive into that bowl). On Ewan's visit, service was perfectly friendly, and there was a good range of dishes available -- a pasta and a risotto the two vegetarian options (around £10 each). The pasta was rather tasty and served in an earthenware bowl. My friend's black bream was tasty, though the broccoli was a little too al dente for her liking, and the anchovy-flavoured mash strange but nice. Unfortunately, however, the cheese board we finished with was greatly disappointing -- the blue cheese was perfectly decent, but there was one extremely hard cheese, and the brie was straight out of the fridge, so cold and hard; the board came with only two crackers. It might be best to stick to the desserts if eating here. As a food hall, it offers fresh and prepared vegetables (mostly organic), cakes and biscuits baked in the store, a takeaway selection from the day's menu and a range of goods (beer, wine, sherry, cheese, chocolate and more) from independent, artisanal producers from across continental Europe, Britain and the Americas . There are also some oddly mundane goods (standard US pancake mix) on the shelves. The shelves are very tall and stuffed with goodies; the dining tables are set closely together between the shelves and the food stalls. It can feel odd to eat here and have shoppers edging past your table. It can be disconcerting to reach past diners to get at your choice of fruit pickled in brandy. Over the years they have put in more tables and reduced the number of food stalls, which itsbruce finds a bit of a shame as their range of goods has shrunk a little. The staff are mostly friendly but a couple of the senior staff are unpredictable and can be amazingly rude to unfamiliar customers. The decor manages to be both elegant and utilitarian (which would be a good description for the whole approach of this place). The toilets are beautiful and kept very clean but downstairs and not easily accessible to the less-than-able-bodied. Overall, an unusual and interesting place and worth trying out (many times, in itsbruce's case). Last visited by Ewan and Melissa, 30 January 2009. Last edited 2009-04-21 18:11:05 (version 10; diff). List all versions. Page last edited 2009-04-21 18:11:05 (version 10).